From its inception, Mailpoint has positioned itself as a reliable partner and a professional, full-service direct mail and direct marketing organisation. During the last few years, our clients have had to adapt their business to meet the requirements of an increasingly digital environment. Mailpoint faces the challenges of this fast-changing industry by continuously responding to client needs with up-to-date technical knowledge, creative thinking and an effective and flexible approach. This website provides you with an insight into our activities as a direct mail and marketing organisation. How does Mailpoint think along with its clients? What is our approach? What can our expert mail consultants do for you? In addition to processing and finalising direct mail activities, Mailpoint services direct mail and sales campaigns from start to finish. If desired, we can also mutate, deduplicate, update and secure digitally delivered address databases. We guarantee that each printed and personalised mailing, with or without a premium, is prepared for postage and delivered right on time. 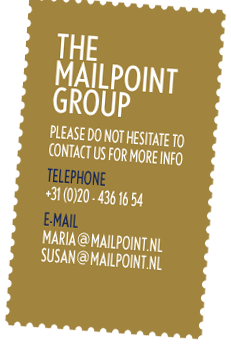 In short, Mailpoint makes a success of every mailing and is ready to service you!